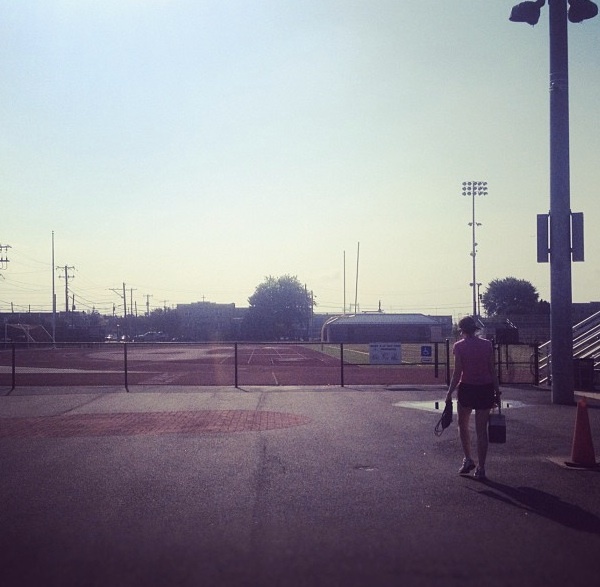 Track Workout #1: 10 x 400m with 400m rest intervals. Pace: Determine 5K mile-pace, then divide by 4 and subtract 10 seconds. (Example: 19:15 5K is a 6:12 mile. Divided by 4 gives 1:33, subtracting 10 gives 1:23 for each 400m interval.) This takes the idea of “easy at first, brutal at the end” to the extreme.” And it’s so easy — Run 400m, jog 400m. After one or two of these, it seems like a breeze. Get to number 6 or so, and all the sudden 4 more is out of the question. But because each only requires a short effort, I find myself thinking “Ok, I can manage just one more.” And then after a rest, I think the same thing. And so on until the end. Track workouts always amaze me. Such short distances, most are 2.5-3.5 miles and yet you are truly spent by the time it’s over. If you’re not, then you’re not doing them right! I challenge you to get out there and try this track workout! Then come back here and tell me how you feel! Strength exercises can help you run faster, longer and reduce injury. A few weeks ago Q of ReÜ agreed to take me on as client (not an easy task considering my lack of coordination and abundance of complaints). Q is working on my strength as an endurance athlete. You see, I am accident prone. And I am heading into my third marathon with hopes to do an ultra 50K a few weeks after that. I need to stay injury free. So far, I have not trained for a marathon without injuries. The first marathon I had IT issues and a groin pull. The second marathon I had both posterior and anterior shin splints. This year I am bound and determined to get through a season without anything more than minor aches and pains. I love Q’s approach to strength training. He is a great motivator. His commands are gentile yet effective and his exercises are simple yet powerful. Many of Q’s routines use your own body-weight which makes them easy to do at home or when you are on your own in the gym. Below is a little glimpse into my sessions with Q and my other classmate (fellow tough-girl) Dana. Q trains out of Level 1 Fitness. He has small group sessions and is also available for one-on-one by appointment. Q and ReÜ provide a full-service program for well-being including meal planning, personal training & yoga. ReÜ’s website is almost ready for launch. Can’t wait until the launch? You can contact Q at info@re-u.co or (267) 702-3026. Also, be sure to go to ReÜ’s Facebook page, more info will be added there soon! August was jam-packed with super fun (crazy) trail races hosted by Pretzel City Sports, Uber endurance Sports, and the Trail Dawgs. They were all so silly and fun, I’m having a hard time picking my favorite! Ooops, I fell! Nothing a little German beer cant fix! Mt Cuckoo 15K – My favorite finisher’s award to date! Say hi to Chuckie! My newest trail virgin! Small race full of heavy hitters! Thanks Cee’s for introducing me to the Trail Dawgs! July was a lot dirty, a little smelly and I loved it! Then there was my 3rd annual Down & Dirty… I just love this race. The City of Brotherly Love welcomes the 3rd visit of the Merrell Down & Dirty National Mud and Obstacle Series presented by Subaru at Fairmount Park in the heart of Philadelphia! July was hot, dirty, and smelly… and I loved every moment of it! Sunday, August 12, 2012 * 9:00 AM * No Field Size Limit! NEW COURSE FOR 2012 – NOT EASIER! JUST NEWER! Because A Mind is a Terrible Thing…..
On Sunday, June 3rd 2012 I completed my second marathon to benefit The Leukemia & Lymphoma Society. I raised nearly $4,000 for Team In Training and had a fantastic time doing it! Thank you to my friends, family and teammates for all your support!